This morning U.S. stock futures are slight higher as we head into the final day of the week’s trading. European markets are posting gains, following a mostly positive trading session in Asia. I ran my routine stock screens early this morning and added 3 new stocks to our watch list. I removed ICUI as shares fell yesterday -6.4% and are now too far below their TRIGGER PRICE. Our LOPE was also cut for the same reason. Meanwhile, INTU was removed as it had traded higher above its TRIGGER PRICE, yet the volume never made our daily +50% min. increase. Shares of that stock are now getting too extended to be properly buyable. 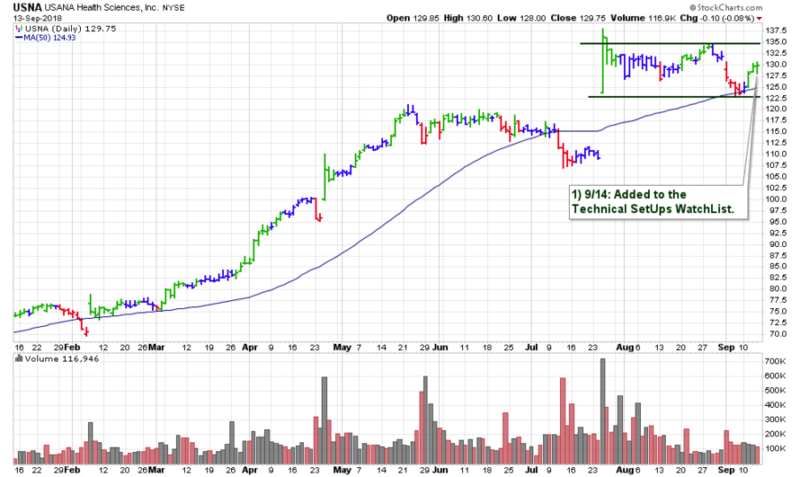 We again have a lucky 13 stocks which we will be watching for the next buyable breakout – see here. One stock in particular is USNA which was just added as this cosmetics/personal care leader is building a base above its 50-day moving average.